I love Curacao's contrasts: the island welcomes tourists, but never seems too "touristy" ... there's plenty to do, but the island is big enough that it's easy to go off and find yourself some needed seclusion ... and when you're tired of lounging in the sun sipping cocktails there are plenty of ways to get your body moving, from mountain biking to hiking. The island's tourism slogan says it right: "Curacao: Real. Different." Location: In the southern Caribbean Sea just off the coast of Venezuela. Currency: Antillean Guilder; U.S. dollar widely accepted. If you love the ocean, plan to stay on or near Sea Aquarium Beach, where you'll have easy access to dive excursions and the aquarium's animal encounter programs and marine exhibits. 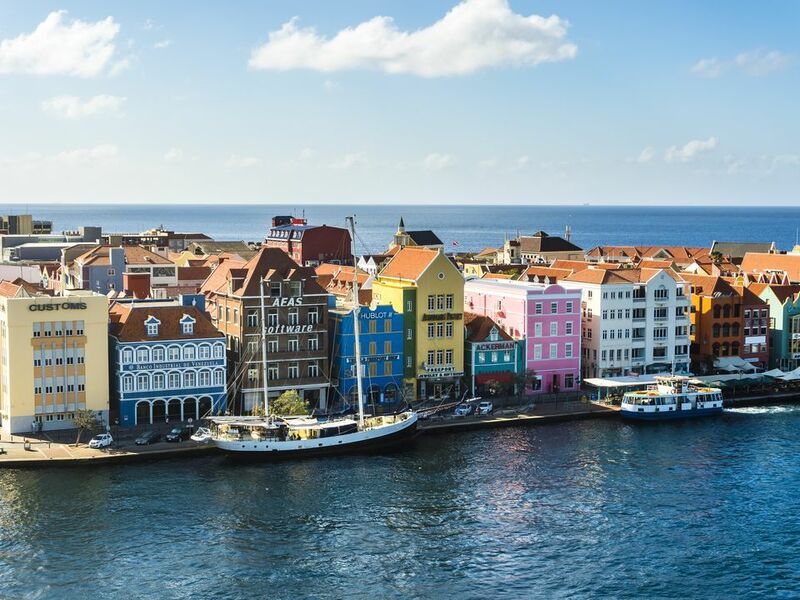 Willemstad is a picturesque walking city, rich with history, shopping, and vibrant culture. The northwest end of the island is less developed, offering outdoor activities like ATV tours on the rugged coastline, climbing Mt. Christofel, or exploring the Hato Caves. A tour of the Curacao Liqueur Distillery is free and fun. Jan Thiel Beach is probably Curacao's most well-known (and most developed) beach, protected and excellent for kids. The Sea Aquarium (or Seaquarium) Beach and adjoining Mambo Beach is the party area, lined with nightclubs, shops, beach bars, and water sports vendors -- plus outdoor massage tents. The northeast coast of Curacao is dotted with small beaches, many with a neighborhoody feel. Playa Kalki is known for its diving, while locals flock to Knip Beach and Little Knip Beach. From the laid-back European feel of the Lions Dive Resort to the urban luxury of the Hotel Kura Hulanda, Curacao offers a wide variety of hotels and resorts. All-inclusive fans will love the Breezes resort, while the Papagayo Beach Resort caters to those who prefer a residential environment where they can fix their own meals. The exclusive and secluded Lodge Kura Hulanda also offers all-inclusive packages, while the Hilton and Renaissance resorts in Willemstad offer a full-service hotel experience, including casinos. Dining out in Curacao is a culinary adventure: Dutch influences are found in dishes like bitterballen (spicy battered meatballs) and a penchant for rijsttafel, a sort of tabletop buffet served at Asian restaurants like Jaipur and Bali. Jaanchie's in Westpunt is a must for seafood prepared with traditional Curacao recipes and ingredients, including iguana. A number of Curacao's old landhuis (plantation homes) have been converted to fine-dining restaurants, which also can be found in Willemstad at the Kura Hulanda hotel and elsewhere. Many of the buidings and some of the food on Curacao is Dutch, but the island's diverse cultural influences include a Jewish population that settled on the island in the mid 17th century and the unique music and language developed by the island's African slaves and their free descendants. Ancient "tambu" music has been passed down among Curacao residents from generation to generation, and the local creole language, Papiamento, has been spoken here for more than 300 years. Carnival, an extended celebration that peaks in March, is the highlight of the cultural calendar in Curacao, but it's hardly the only thing happening. In addition to events centered on diving, boating, and other maritime activities, Curacao has a host of food festivals as well as sporting events, including an annual marathon, drag races, and even a bridge competition. Willemstad has the upscale nightclubs and casinos, many located at city hotels and resorts; check out the Salinja neighborhood for the best variety. Sea Aquarium Beach has the best beach parties and live music at clubs like Mambo Beach and Wet and Wild. Party boats like Mi Dushii move the dancing and drinking offshore.